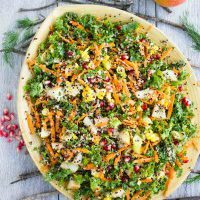 This Quinoa Harvest Salad is a wonderfully autumnal and incredibly healthy vegan dish that includes delicious seasonal vegetables like corn, carrots, pears, and pomegranate seeds as well as superfood quinoa and kale! 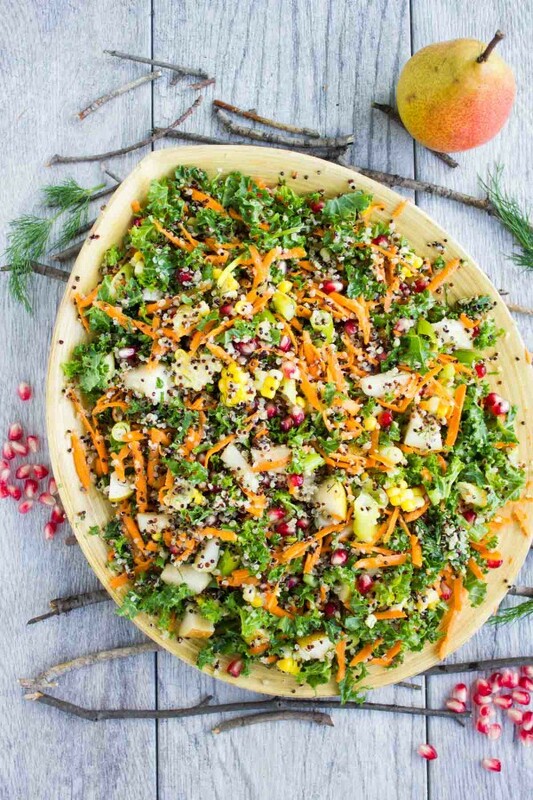 This Quinoa Autumn Harvest Salad recipe is a fresh and vibrant, bursting with flavors of pomegranate, pears, carrots, kale, corn and quinoa, all rounded up with a sweet dill mustard dressing that just brightens up your palate. And the best part is, it’s ready in 15 mins and there are no limits to anything you want to add in or substitute! Hello, Thanksgiving preparations? This Harvest Salad is bursting with freshness, texture and fall flavors. We add all the lovely seasonal Autumn produce you could find that doesn’t need cooking or roasting. The recipe for this Harvest salad is super easy! You can chop, grate, mix and devour it in a flash. I also wanted a more fresh feel to the harvest salad. 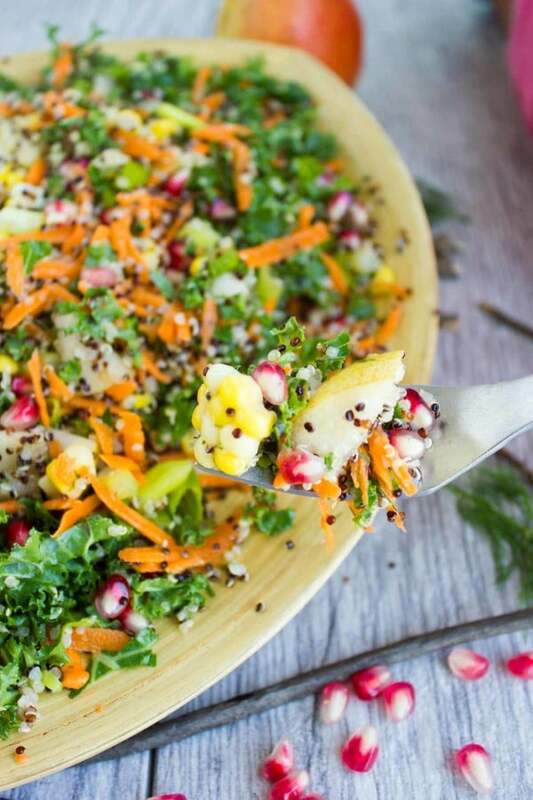 Especially around Thanksgiving, a light, bright and fresh quinoa salad like this one is perfect to counterbalance all the roasts and starchy sides. So I started making my harvest salad by cooking the quinoa, which I explain with tips and tricks in this how to cook quinoa post—strongly recommend you give that a read if you’re a quinoa person like me or know a special quinoa person in your life. While the quinoa is cooking, you’ll get your fruit and veggies ready. And then just toss everything together and dress it up when you’re ready to devour your Quinoa Harvest Salad. Now, let’s talk about the dressing for this Quinoa Autumn Harvest Salad, I opted for my sweet mustard dill sauce. I really loved the freshness the dill added to this healthy, protein-packed superfood salad. And it pairs beautifully with every single ingredient. For the record, I made this Quinoa Harvest Salad before, using apples instead of pears and dressed it up with this honey Greek salad dressing and it was so refreshing too! I just dared myself today by switching to dill and I was amazed at how vibrant it came out. If you’d like a warmer feel to the Harvest Salad, try the basil balsamic vinaigrette I used with this blackberry pecan roast veggie salad. 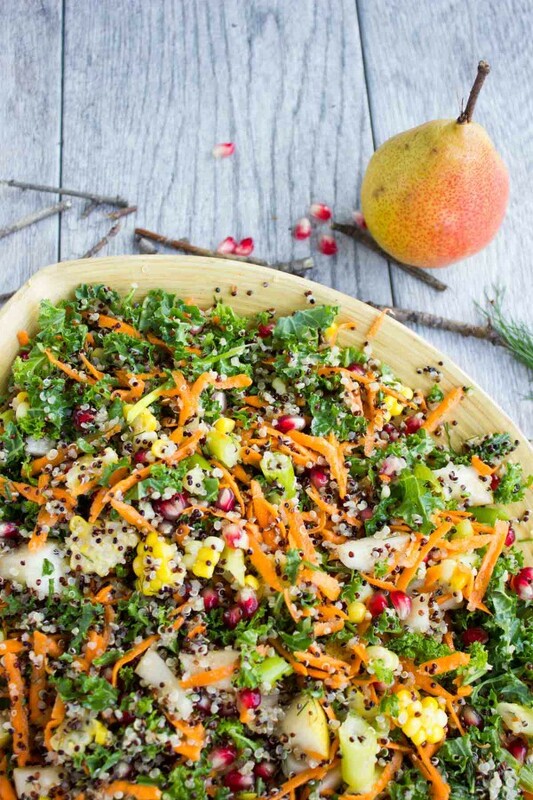 I think however you dress this healthy Quinoa Autumn Harvest Salad—you’re bound to love it ! So let’s go back to the healthy fall-inspired ingredients of this Harvest Salad. I used pomegranate seeds for a sweet tangy crunch, pears for pure sweetness and soft texture, shredded carrots for a nice carrot bite, fresh cooked corn for more sweetness and bite, chopped scallions for a bit of contrast to the sweetness, and fresh chopped kale for health benefits. All these lovely fruits and veggies are tossed with plenty of cooked quinoa for a boost of “nutrition” , added protein and a perfect bite! The dill dressing really brightens, sweetens and rounds off this healthy, fresh Harvest Salad. Feel free to use any dressing you want for this healthy quinoa salad. Instead of pears, you can also use apples! Roasted squash would be another wonderful addition to this fall-inspired salad. This Harvest Salad is vegan. For even more vegan protein, add fried tofu, nuts or chickpeas to this harvest salad! For more salad recipes, check out my blackberry pecan roast veggie power salad – another Fall favorite! 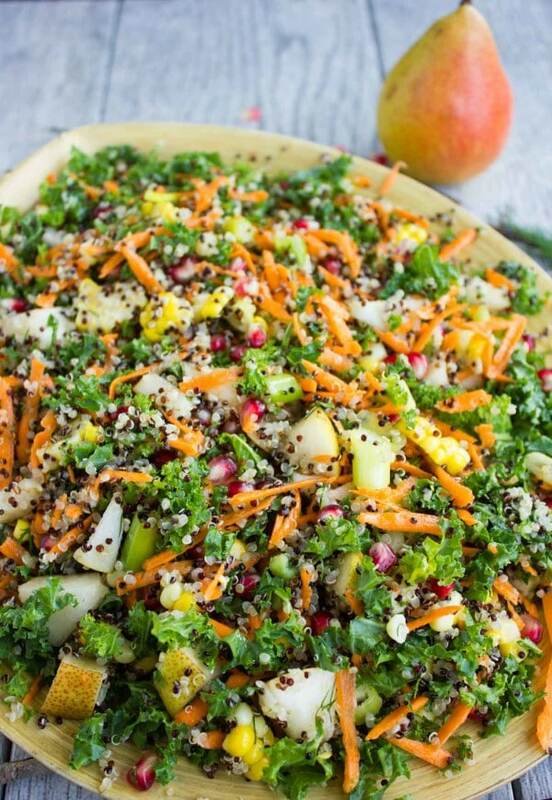 This easy Quinoa Harvest Salad is a wonderfully autumnal and incredibly healthy vegan dish that includes delicious seasonal vegetables like corn, carrots, pears and pomegranate as well as superfood quinoa and kale! Cook the quinoa—details in this how to cook quinoa post. In a large plate, toss the quinoa with the remaining salad ingredients. 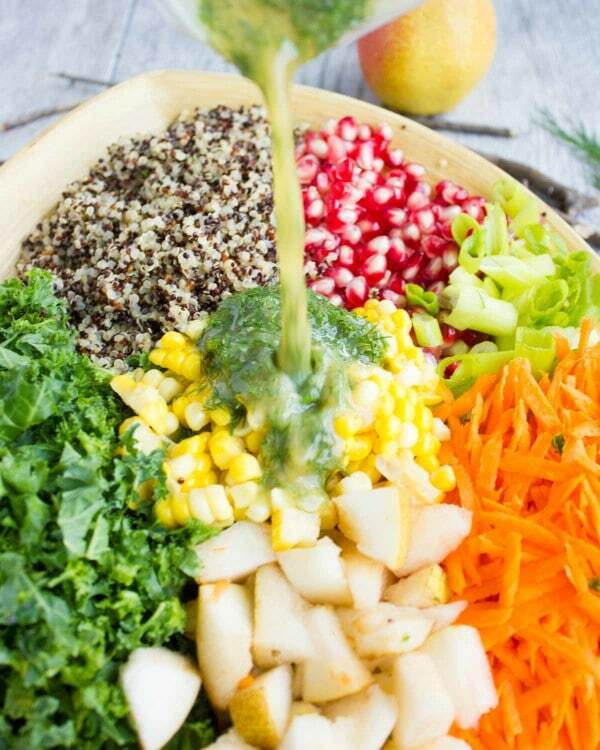 Pour the dressing over the salad and toss together. Serve. This looks fabulous! Exactly what I needed to boost my energy levels???? Already have my quinoa cooking and cant wait to indulge! Its day 2 and still enjoying it???? Go for it !! :) Enjoy! Made another one today and still enjoying it ???????? Absolutely beautiful and vibrant salad! I think this would convert a non salad lover into a full-on veg head (I don’t know if that’s a phrase, but it should be). This looks fantastic! 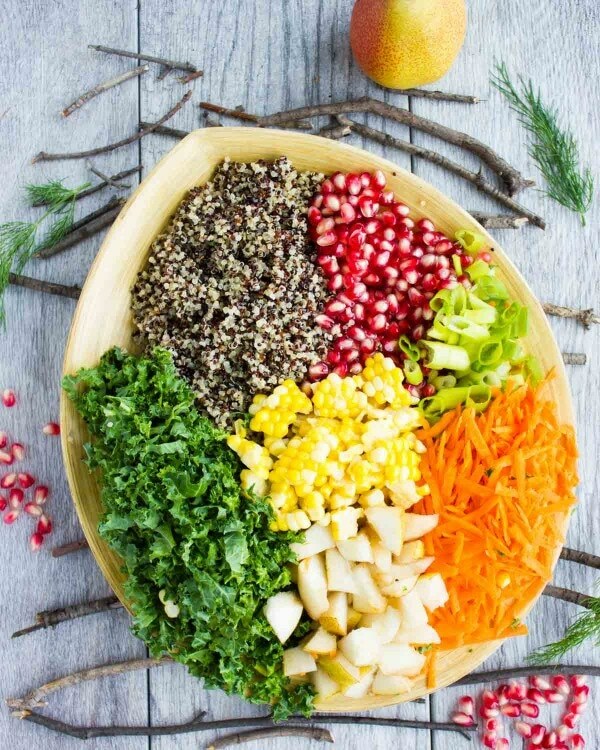 I love all of the colors and bright flavors going on in this salad. 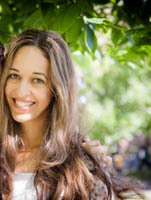 This is the perfect healthy way to ring in fall! This looks so refreshing and light. I love how simple and easy this is. I love quinoa but I don’t make it as often as I should – I think I will love this. Saving for later. What a beautiful salad and it screams Fall!! I love the color and the ingredients — the pomegranates are a nice touch. It’s a good thing we have quinoa on hand. Hope you make it Marisa!! I love a refreshing Fall salad, specially now while Fall still feels like Summer! Love the addition of quinoa! I would devour this salad in minutes.